Copper is highly concentrated in the brain, and one area of the brain, the locus coeruleus (LC), has the highest levels—around 10 times higher than other areas of the brain. What is all this copper doing in the LC? 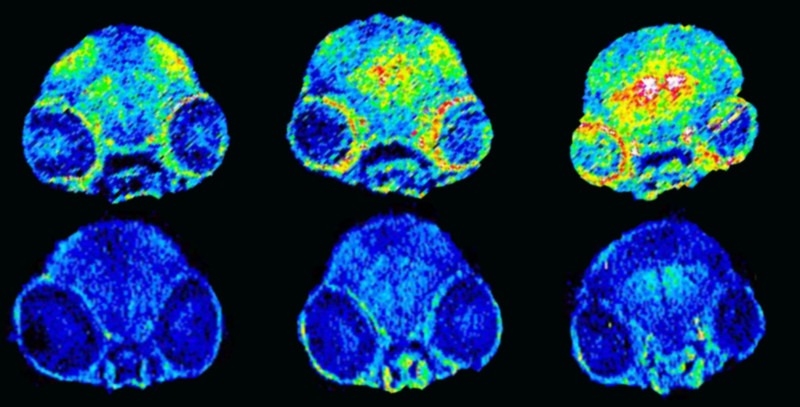 Visualization of copper in wild type (top row) and mutant (bottom row) zebrafish brains. Credit: Tong Xiao, Chang Lab. The Berkeley Neuroscience labs of Chris Chang and Ehud Isacoff collaborated to find out. In an article recently published in Nature Chemical Biology by Xiao, et al., they investigated the role of copper on sleep-activity cycles in zebrafish, since the LC mediates these cycles in fish as well as humans. Using copper visualization techniques, they found that zebrafish with a mutated copper transporter gene were specifically deficient in copper in the brain. Compared to their wild type counterparts, these mutants were sluggish and less active during the day, and more active at night—indicating poor quality of sleep and a disrupted circadian pattern of behavior. To confirm that copper was involved in regulating this pattern, the researchers pharmacologically lowered copper levels in wild type fish. These fish had a disrupted activity pattern that was similar to the mutants, supporting the idea that copper is a key player in this process. The selective removal of the LC had a similar effect, confirming the importance of this brain area in regulating sleep-activity cycles. How could copper affect sleep-activity cycles? The researchers propose that the enzyme dopamine β-hydroxylase (DBH)—which is found in high levels in the LC—is an important link between the mineral and the behavior. DBH requires copper to synthesize the neurotransmitter norepinephrine (NE) from dopamine (DA). They found that the copper-deficient mutants had a 37% decrease in their NE/DA ratio—indicating that copper may normally regulate sleep-activity cycles in the LC by promoting production of NE. Indeed, when the researchers increased NE at synapses in copper-deficient mutants using a NE reuptake inhibitor, their circadian pattern of behavior returned to normal. Credit: Tong Xiao, Chang Lab. Published in Nature Chemical Biology. The discovery of this copper-dependent pathway may lead to better understanding and treatment of human sleep disorders, as well as many other neurological diseases and disorders—such as Alzheimer’s disease, Parkinson’s disease, and autism—which are known to involve altered copper homeostasis.